I am not 100% certain that this is public land, but there shouldn't be any issue walking to the tunnel. You can walk either from the end of Cruickshank Road or from King Charles Drive. The King Charles Drive route is flat and easy but a bit longer - about 1.6 km. 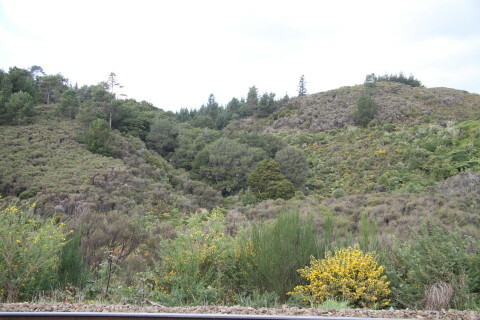 From the Cruickshank Road end, go under the railway line and turn sharp left and follow the track around and up the hill through the beech trees. It is shorter but steeper and can be slippery after wet weather. Eventually the track drops down about 50 metres from the tunnel on the King Charles track - which at one time would have been the railway line. The track is not marked, but the route is obvious and well kept. Cruickshanks Tunnel is 120 metres long and can be walked safely without a flashlight. At the Mangaroa end there is some open grassland and the river. 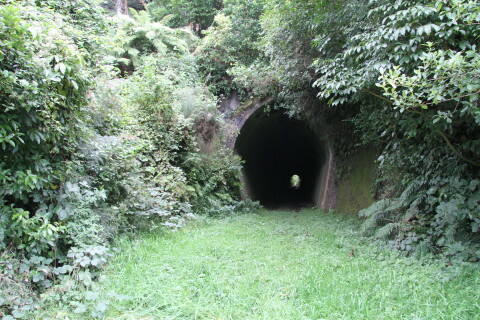 If you go through the tunnel there is a stream a short distance away, and a 4WD track going up to the right. This is definitely private land. You can return the same way or continue to the other entrance. The total length is about 2 km, and if you walk back round the streets it will double your distance. Allow an hour for a return walk. Park either at the end of Cruickshank Road, which is off Fergusson Drive, or the end of King Charles Drive which is off Park Road, again off Fergusson Drive in Upper Hutt. It is within walking distance from Upper Hutt town centre.